App Service provides a highly scalable, self-patching web hosting service in Azure. It also provides a managed identity for your app, which is a turn-key solution for securing access to Azure SQL Database and other Azure services. Managed identities in App Service make your app more secure by eliminating secrets from your app, such as credentials in the connection strings. In this tutorial, you will add managed identity to the sample ASP.NET web app you built in Tutorial: Build an ASP.NET app in Azure with SQL Database. When you're finished, your sample app will connect to SQL Database securely without the need of username and passwords. This scenario is currently supported by .NET Framework 4.6 and above, but not by .NET Core 2.1. .NET Core 2.2 does support the scenario, but is not yet included in the default images in App Service. Azure Active Directory authentication is different from Integrated Windows authentication in on-premises Active Directory (AD DS). AD DS and Azure Active Directory use completely different authentication protocols. For more information, see Azure AD Domain Services documentation. 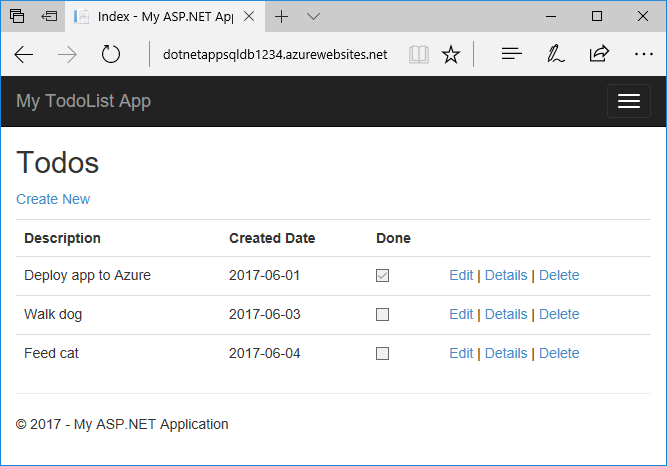 This article continues where you left off in Tutorial: Build an ASP.NET app in Azure with SQL Database. If you haven't already, follow that tutorial first. Alternatively, you can adapt the steps for your own ASP.NET app with SQL Database. To enable a managed identity for your Azure app, use the az webapp identity assign command in the Cloud Shell. In the following command, replace <app name>. Next, you grant database access to your app's managed identity, using the az sql server ad-admin create command in the Cloud Shell. In the following command, replace <server_name> and <principalid_from_last_step>. Type an administrator name for <admin_user>. The managed identity now has access to your Azure SQL Database server. Modify the connection you set previously for your app, using the az webapp config appsettings set command in the Cloud Shell. In the following command, replace <app name> with the name of your app, and replace <server_name> and <db_name> with the ones for your SQL Database. This constructor configures a custom SqlConnection object to use an access token for Azure SQL Database from App Service. With the access token, your App Service app authenticates with Azure SQL Database with its managed identity. For more information, see Obtaining tokens for Azure resources. The if statement lets you continue to test your app locally with LocalDB. SqlConnection.AccessToken is currently supported only in .NET Framework 4.6 and above, as well as .NET Core 2.2, not in .NET Core 2.1. To use this new constructor, open Controllers\TodosController.cs and find the line private MyDatabaseContext db = new MyDatabaseContext();. The existing code uses the default MyDatabaseContext controller to create a database using the standard connection string, which had username and password in clear text before you changed it. All that's left now is to publish your changes to Azure. In the Solution Explorer, right-click your DotNetAppSqlDb project and select Publish. In the publish page, click Publish. When the new webpage shows your to-do list, your app is connecting to the database using the managed identity. You should now be able to edit the to-do list as before. During the earlier steps, you probably noticed your managed identity is connected to SQL Server as the Azure AD administrator. To grant minimal privileges to your managed identity, you need to sign in to the Azure SQL Database server as the Azure AD administrator, and then add an Azure Active Directory group that contains the managed identity. If you want to see the full JSON output for each command, drop the parameters --query objectId --output tsv. Previously, you assigned the managed identity as the Azure AD administrator for your SQL Database. You can't use this identity for interactive sign-in (to add database users), so you need to use your real Azure AD user. To add your Azure AD user, follow the steps at Provision an Azure Active Directory administrator for your Azure SQL Database Server. Once added, don't remove this Azure AD administrator for your SQL Database unless you want to disable Azure AD access to the SQL Database completely (from all Azure AD accounts). In the Cloud Shell, sign in to SQL Database by using the SQLCMD command. Replace <server_name> with your SQL Database server name, <db_name> with the database name your app uses, and <AADuser_name> and <AADpassword> with your Azure AD user's credentials. Type EXIT to return to the Cloud Shell prompt. Advance to the next tutorial to learn how to map a custom DNS name to your web app.